Thousand of years have passed since magic was lost to mankind…Knowledge to this mystic force vanished with the ages; those who knew its existence were few and far between. But man fears what he does not understand. Thus, those born with the “gift” of magic were destined to life of persecution and hatred. Ultimately, this injustice spurred one man to action. A powerful Magus in his own right, he and his eight disciples took a stand against the Holy Empire and the Orthodox Church. It was long and grueling battle ~ one that cost the man his life. But in exchange, his final wish was granted; Magi would be allowed to live alongside humans as soldiers of the Empire. They become known as RKS: Rosenkreuzstilette, the “Blades of the Rose Cross”. Rosenkreuzstilette (lit. 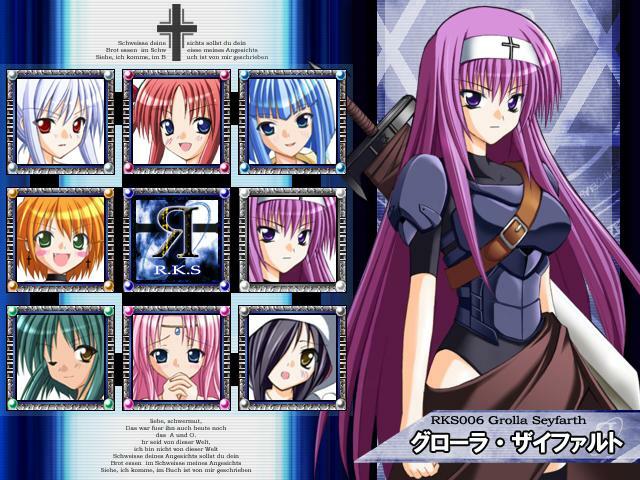 Stilettos of the Rose Cross), sometimes abbreviated as RKS, is a doujin action platformer released by [erka:es] at Winter Comiket 73, on December 30, 2007. Rosenkreuzstilette based upon the original Mega Man series with similar setting to Castlevania, but with original story and characters. The digital re-release of the game was released as Rosenkreuzstilette [erka:es] The Best Edition on July, 2009. An English translation patch made by fans currently compatible with version 1.05c. Rosenkreuzstilette was followed up by a sequel named Rosenkreuzstilette Freudenstachel which was released at October 2012. In Rosenkreuzstilette the player takes control of Spiritia Rosenberg, the main protagonist and also the first member of the RKS. Gameplay-wise, Rosenkreuzstilette entirely the same as Mega Man in which player navigating through enemy, traps and defeating the boss at the end of each stage. Spiritia is capable of all the techniques used by the original Mega Man including standard shot, charged shot for more powerful blast, jump and slide move under small space for avoiding attacks. Spiritia is also able to copy the powers of her fellow Magi upon their defeat and summon Lili to assist her in battle. Difficulty-wise, the game is comparable with Mega Man 7 or 8, challenging enough to keep player coming back a few times. But once player learn the stages and boss patterns, they should have no problems. One interesting thing is whenever a boss is a half-way to defeat, they will perform different attacks from what they did before. 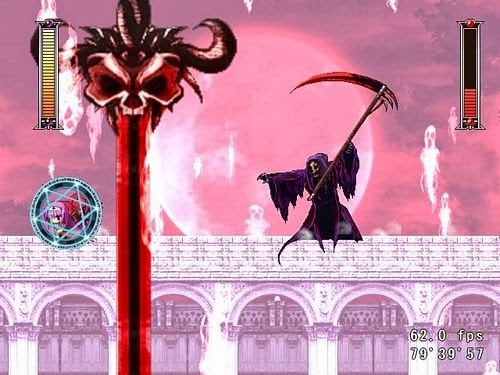 This boss battle give more challenging aspect since player must find better strategies. But on the other side it makes the battle much more interesting. There are two game modes: Story Mode and Arcade Mode. Both modes basically are the same, but in Arcade Mode is straight up, without dialogues and cutscenes. By completing the game will give player the code to play as Grolla Seyfarth, one of the game’s eight boss. Grolla plays like Zero, swings a sword which is more powerful than Spiritia standard shots. Grolla also can perform more combos, a dash and can grab walls. However, since she uses a sword, her range is very limited. She takes twice as much damage as Spiritia and gains no weapons from bosses. To play as Grolla, at [erka:es] logo screen, press Left, Right, Weapon Select R, and Weapon Select L in that order. If the code is entered correctly, you will hear Grolla shout “Grollschwert!”. If you re-enter the code at [erka:es] logo screen, you will hear Spiritia shout “Seelegewehr!” and the game returns normal where you play as Spiritia again.